So, five months after our last post, we figured it was high time to let you know how things are going. We honestly do have good intentions of updating the blog, but we’ve gotten so far behind that it’s too hard to catch back up. Here’s hoping that this post will lead to a few more in the not-too-distant future, including some “summer summaries” from our amazing travels and time with family in June, July, and August. The fifth graders are happy to see Alex on the first day of school. – Alex has 3 English clubs every week for elementary, middle, and high school pupils. Although students don’t often want to stay after school, he works hard to make sure that they will have interesting things to do, even if only two students show up. He’s also been working with a few 10th grade girls who speak exceptional English. They meet twice a week before classes to further improve their English skills. – I help in 12 English classes a week – 8 lessons on Wednesday and 4 on Thursday. I also try to corral a couple of kids to English Club once a week. – Alex began a Programming Club with the school’s computer teacher. Using a program called Scratch, the students are slowly learning how computer programs work and designing some of their own games. The Lyceum English Club hangs out at the police station. – I wrote and won two grants for the Lyceum: one to begin a Geocaching Club among multiple district schools, and the other to install a new shower, toilet, and two new sinks in the dormitory. You can read about this project. Alex just applied for the same grant, hoping to install soap dispensers, hand dryers, and a water fountain near his school’s cafeteria in order to improve sanitation. – Both of our schools held wildly fun Halloween parties. Sofievka students have loved learning about this “American” holiday and have really gotten into the spirit. We expect that pumpkin carving will now become an annual tradition here! Many thanks to our family and friends who provided Halloween goodies and decorations! 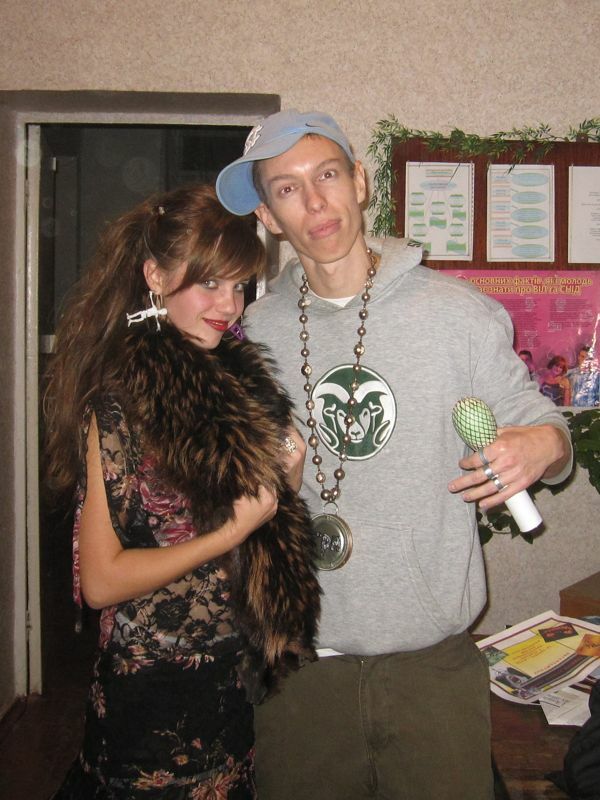 Alex's "rapper" costume was a hit with the high school girls! – Alex has been totally revamping the old PC Ukraine volunteer website. You can get a glimpse of the future version, although it’s still under construction. (About a million times better, eh!?!) He is chair of PC’s Technology for Development working group and delegates as much as possible, but there’s still plenty to do. – I am very active in PC’s Gender and Development Council and have been working recently to improve the trainings and information about sexual assault that are provided to trainees. I’ve connected with a pretty cool organization of Returned PCVs – First Action Response – and have been sharing information with volunteers in Uganda. I wrote two articles for PC volunteer newsletters, one about using (well, NOT using) the phrase “you guys,” and another about some of the causes of gender-related violence. – Alex has designed a rockin’ counter for use on World AIDS Day (December 1). It says: “___ people live with HIV in Ukraine,” and “___ people live with HIV worldwide.” “HIV is preventable and treatable. Protect yourself!” Check it out, and even download it if you’d like to use it yourself! 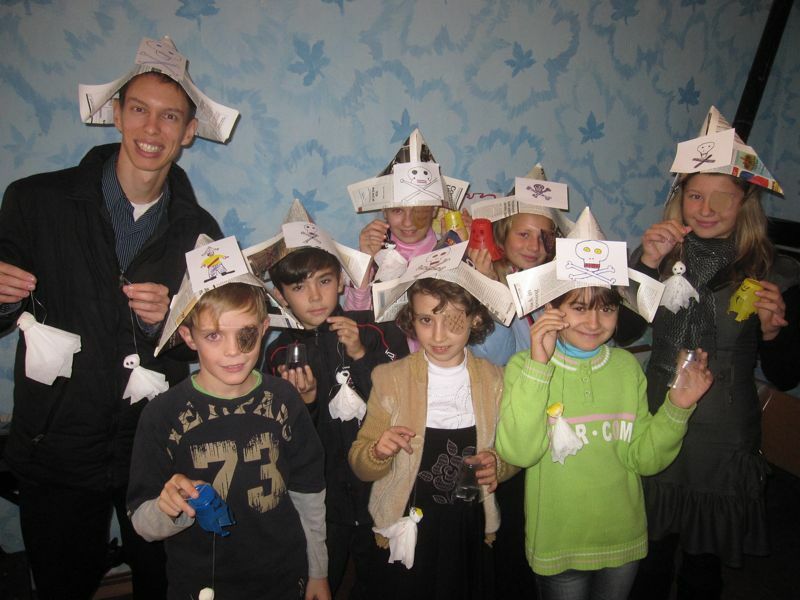 Middle-school English Club students become pirates (with ghosts) for Halloween. – We had two mice running around our kitchen for a month or so. The first one was caught with a good ol’ trap, but the second was too smart for that. We finally cornered it and trapped it in a box, carried it a quarter-mile away with lots of nice warm buildings between, and let it go. Knock on wood, it hasn’t been back since! – I studied throughout September and October, took the GRE, and got pretty decent scores. I’m applying to MPH programs (and one joint MPH/MSW) beginning next fall. The grad school research and application process hasn’t been convenient from here, but it’s doable. It stinks to already have to think so much about the future, but grad school deadlines necessitate it. Hard to believe we’ve been here over 19 months, with less than 7 to go! Some of our good friends have just completed their 2+ years, and it’s sad but exciting to see them head back to the States. 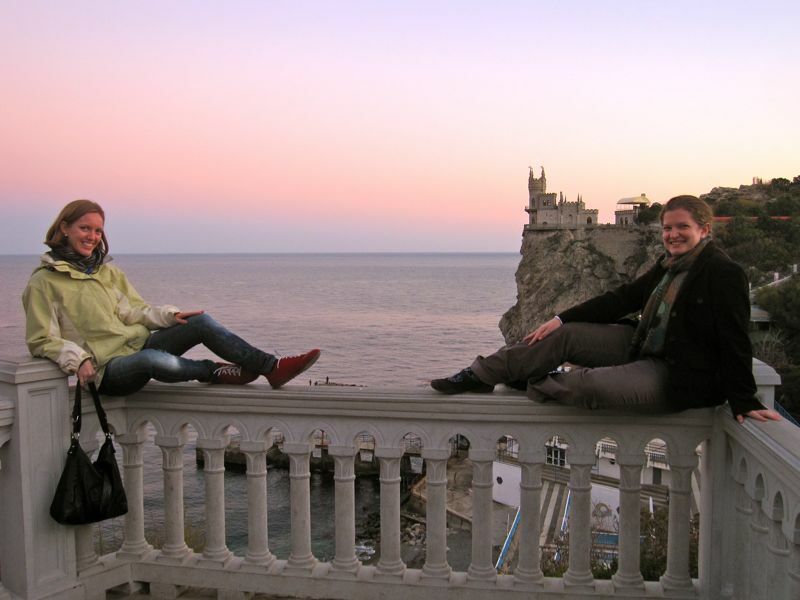 Sara and I hang out at the "Swallow's Nest" in Yalta. – We managed to squeeze in a little vacation time recently when my fabulous college friend Sara came to visit. Although we had a crazy week and spent more time on public transportation than off, we had a great time and really enjoyed catching up. We got to see some amazing sites in Crimea – Bakhchisaray, Yalta, and Balaklava/Sevastopol. Remember: you are welcome to visit anytime! – We also got to visit our friend Olya, Alex’s old counterpart, who is now a Technical and Cross-Cultural Trainer with Peace Corps! She’s enjoying her new job, although she’s very busy and misses her family since her training site is near Kyiv. We hope this position will open up even more opportunities for her – she’s an amazing person who has big dreams! – We are fortunate to be able to spend a couple hours every week talking with family and friends over Skype. I can’t imagine being a volunteer without a home Internet connection – it’s so nice to be able to keep up with everyone and really helps when we feel homesick! Look us up if you want to chat sometime! 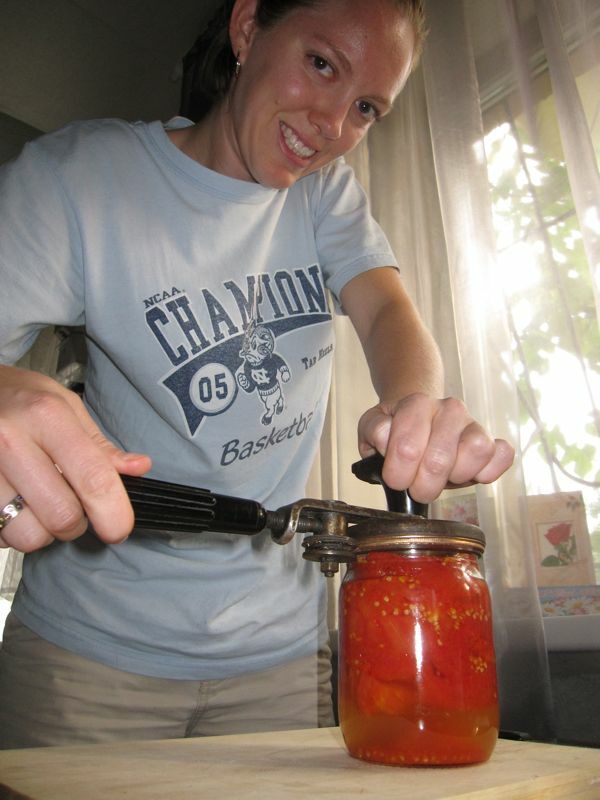 Working on canning 18 pints of fresh tomatoes. – Alex and I try to spend some time every day just hanging out, whether it’s cooking together, watching TV shows or movies, or running/walking. It was pretty cold in October, but November has been beautiful. We recently looked up our “Love Languages,” and “quality time” ranks pretty high (if not top) for both of us. (“Receiving gifts” comes last, just so you know!) Some fun kitchen-related projects this fall have been canning tomatoes, making jam, doing our own squash puree for “pumpkin” bread, making cinnamon rolls, and teaching one of my students how to make Halloween cupcakes. 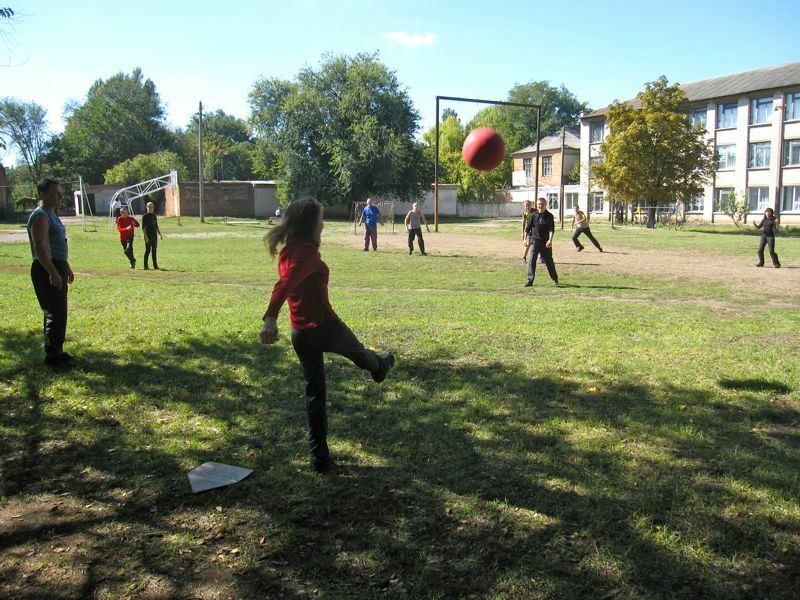 School students play with their new American kickball during PE class. 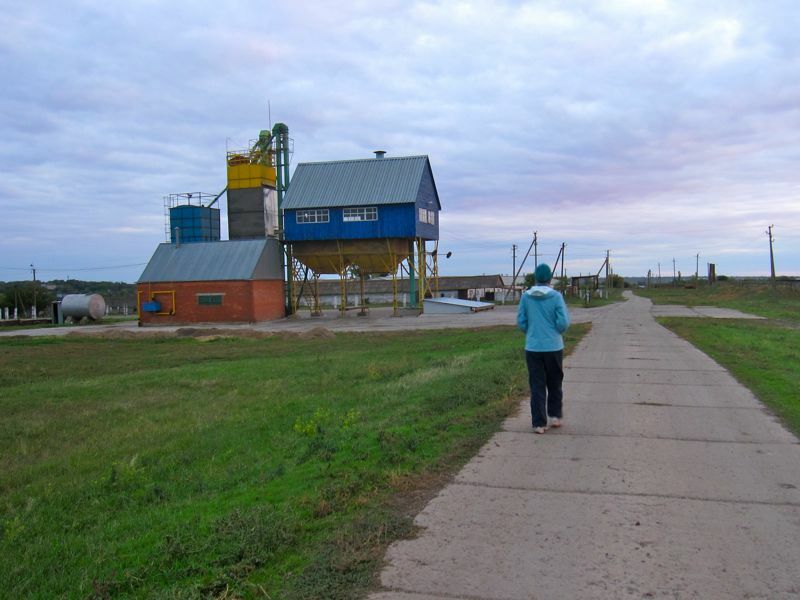 Taking a walk near my favorite Sofievka building - a colorful grain elevator. Second graders show why they need new hand dryers. Emma and Alex, I enjoyed reading your blog. Thanks for posting it. You have been busy, and with a lot of accomplishments to show for your hard work. My Love Language is quality time, also. I’m looking forward to checking out your links in the days to come. Mom and I are driving to D.C. Tuesday evening to spend Thanksgiving with Anna. I’m looking forward to our visit. Unfortunately I cannot run right now. I’m nursing a tender sciatic nerve. I will have an MRI in the morning to see if I injured a disk while improperly living the porch swing at the creek a few weeks ago. I had a shot visit in the mountains this weekend – less than 24 hours, part of which was working on today’s sermon. I think I saw your mouse the other day. It sounded like a Ukraine mouse with its Russian squeak. That’s it for now. Love you tons!